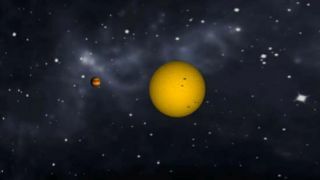 Animation of tidally locked exoplanet CoRoT-1b orbiting its star and changing phases, as our moon does. When new planets are discovered beyond the solar system, they often get boring designations such as HD 85512b or Gliese 667Cc. A startup hoping to liven up these names has launched a project to create a Baby Planet Name Book full of more colorful suggestions. The planet name project is the first official product from Uwingu, a new company that aims to raise money for space research, exploration and education. Now, for 99 cents apiece, you can nominate any name you like to join the new planet name registry, and you can also vote for your favorites among the current list. "The many, many planets discovered across the galaxy in past 20 years are a tribute to our natural human desire to explore beyond the horizon," planet-hunting astronomer Geoff Marcy of the University of California at Berkeley said in a statement. "Now people all over the world can participate in these discoveries in a new way, giving identities and even personality to billions of planets in our galaxy for the first time." To be clear, Uwingu officials say the names won't be official, and won't be attached to particular planets — yet. The only body authorized to officially name celestial objects is the International Astronomical Union (IAU), which hasn't so far expressed an interest in changing the status quo of planet naming. But Uwingu hopes astronomers might use the names from the project to refer to the new planets they keep finding, at least informally. The current tally of confirmed planets is almost 800 and growing, so that's a lot of worlds that need good names. Uwingu will use the money raised from the project to support research efforts like SETI (the Search for Extraterrestrial Intelligence)'s Allen Telescope Array in California, as well as space launches and science outreach. The company has also released a suite of planet-related educational materials for teachers to go along with the new project. "At Uwingu, we think that it’s important that kids learn, as well as play," said Uwingu education officer Emily CoBabe. "So we want to make Uwingu a place where teachers can stop by to get the best and most up-to-date space education materials."